Back Alley Bikes (BAB) is a 501(c)3 non-profit bicycle repair and resource center. Our mission is to provide cycling education and services with a focus on youth development, sustainable practices, and community access. BAB started in 2000 as a part of Detroit Summer. The youth of Detroit Summer needed a way to get to their mural and gardening projects around the city. Bikes were the answer. Soon word got around that folks could earn a bike at BAB. Over the years our programs have expanded to include volunteer nights, youth open shop, Youth Mechanics in Training, Youth Rides, Camp Earn a Bike in the summer and Saturday Earn a Bike all year round. We also opened a full service bicycle repair and retail shop in 2008 called the Hub of Detroit to help support our programming. BAB accepts donations of used bikes of any type, style and condition. Each year we taken in over 800 used bike donations and distribute them back to the community through our Earn a Bike programs for youth ages 10-17. If a child is under 10, we repair the bike as needed and donate it directly to families and various organizations helping youth. In 2014, just under 400 bikes were donated to families or earned by youth who learn to fix a bike and keep it in our Earn a Bike program. Get involved! Back Ally Bikes and Motor City Gears and Beers would like your help! We are asking that if you have any used bikes or biking equipment that you no longer need or use to please bring them with you on October 8th. 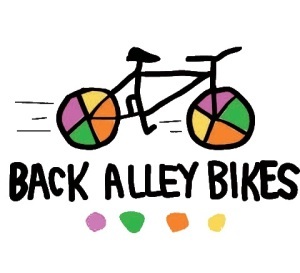 Back Alley Bikes will have a location to accept your lightly used biking equipment to help continue their education for youths all year round. Your time as a volunteer – even if you’ve never fixed a bike, we can find you a way to help! The Detroit Riverfront Conservancy is a 501(c)(3) organization with a vision to transform Detroit’s riverfront and the face of the city into a beautiful, exciting, safe, and world-class meeting place. The ultimate vision is to have five-and-a-half miles of elaborate greenways extending from the Ambassador Bridge to Gabriel Richard Park. The first phase of the Detroit waterfront transformation project begins with the east riverfront, transforming three-and-a-half miles from the historic Joe Louise Arena to the beautiful and serene Gabriel Richard Park. The transformation also includes three new eco-friendly pathways along the west riverfront linking up to West Jefferson Avenue. 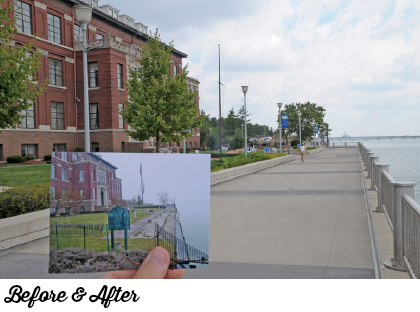 The RiverWalk is expanding immensely, adding 30-feet of extra space to enhance pedestrian recreational activity. The Dequindre Cut is known for its urban artwork, graffiti and a greenway with a 20-foot-wide paved pathway, that has separate lanes for pedestrian and bicycle traffic. To get to the Dequindre Cut entrance ramps are placed at Atwater Street, Franklin Street, Lafayette Street, Gratiot Avenue and at Woodbridge Street. Phase two of the Cut is now in progress to extend the greenway a half mile north from Gratiot Avenue to Mack Avenue. Motor City Gears and Beers is proud to donate a portion of ride proceeds to help perpetuate the astounding efforts of the Detroit Riverfront Conservancy.